This large basalt rock was carved by ancient peoples to map the area of the upper Snake River, possibly as long as 12,000 years ago. The map is believed to have been carved by the Shoshone-Bannock natives long before European contact. It depicts the Snake and Salmon Rivers, as well as the animals and tribes that inhabited the territories in between. No one can decisively say what the carving’s purpose was, which only contributes to its mysterious, ancient allure. The carving might have provided a reference point for travelers and hunters—just by looking at the map they would have been able to navigate the region. There are also theories that the petroglyph was intended to match up with the constellations, and that it could even be used to track the migrations of buffalo, deer, sheep, and elk herds. Other historians offer that it’s unlikely the Shoshone would have put all their hunting knowledge on a map so close to a popular trail for all to see. They believe the rock carving may be more cosmic; a map of all the beings that inhabited the river valley. Despite the fact that the giant petroglyph has been famous in the region for some time, it was only designated a National Historic Site in 2012. 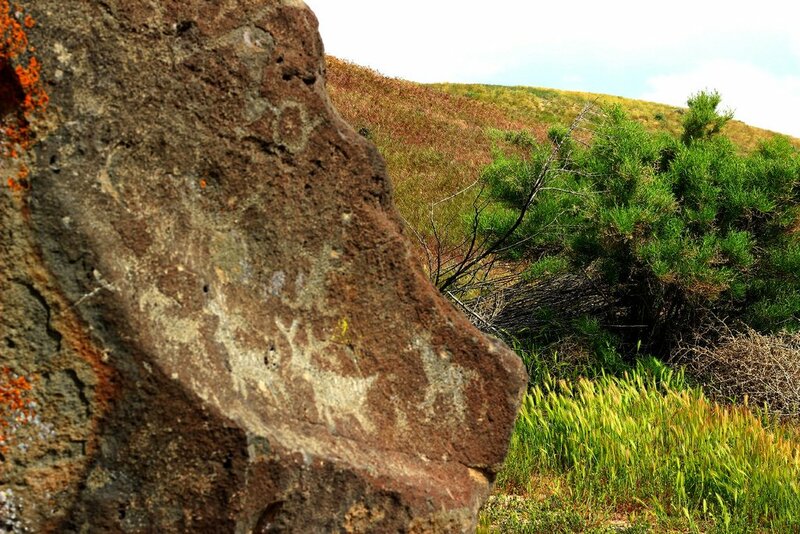 Although Map Rock is the most famous, hundreds of other rock petroglyphs and pictographs can be found in the boulder fields along the Snake and Salmon rivers.